Kaspersky is a well known brand in the computer security world due to their technology to deal with malware in a computer system. A malware is defined as any kind of a computer program designed to make unauthorized access and harm a computer system. When it says Malware, generally it includes viruses, trojan horses, ransomware, spyware, adware, scareware, worms. The severity, and functionality of each type vary. In fact some malware like trojan horses don’t even do any damage, but assist external forces to infiltrate to the system. Recently the entire world was intimidated by a ransomware which encrypts the files of the targeted computer, then the perpetrator threatened victims to pay a ransom in order to get the key to unlock the files in the system. 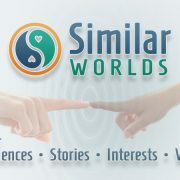 This made huge headlines in various popular news networks from east to west. In fact this affected many smaller nations like Sri lanka too. Unfortunately, this is just one of the examples how a malware can disrupt the operation in a computer system. To prevent such catastrophic incidents business owners and, individuals should consider to keep their computers safe and secure by taking appropriate measures, but how to keep the computer safe and secure? There are many ways to keep a computer system safe. A few of the basic steps are keep the Windows up-to-date (How To Receive The Latest Windows 10 Update ? ), and installing a proper Antivirus guard. Generally an Antivirus guard is suitable for viruses only, but some guards can be used to protect from all kind of malware attacks. There are a lot of the free to commercial antivirus guards available in the market, among them Kaspersky is known to be a lotus in the mud. Kaspersky has both commercial, and free versions of their products. This article reviews this particular version of Kaspersky antivirus guard which is completely free of charge, and yet keeps the computer safe not just from local threats but also from threats coming from external sources. Read this Free Kaspersky Antivirus Download for Lifetime post further to find out what are the features offered by it, and how useful they are to our daily life. According to the system requirements provided by Kaspersky Lab, it works from Windows XP to 10. Also this is an ideal free antivirus for windows 7 ultimate as well. As the features, it provides “File Anti-virus” to keep the file system safe and secure. When a file is opened, or being executed, Kaspersky scans its activities, binary to make sure the file doesn’t contain any harmful malware codes. “Web Anti-virus” to keep the computer safe when the web browser is used. Since it leverages the browser extension developed by Kaspersky along with the antivirus guard, the extension has to be installed prior to take its full advantage. Note that when the “Web Anti-virus” guard is installed, the certs of the encrypted web sites are replaced with a cert of Kaspersky antivirus guard. The extension is available at the Chrome web store for free of charge. There are also extensions for both Internet Explorer, and Firefox, and are automatically installed except the Internet Explorer one when the Kaspersky is finished installing its antivirus guard. The add on for the Internet Explorer can be installed via “Settings -> Additional -> Network” options. To access Settings, use the small cogwheel button in the left bottom corner of the antivirus guard. 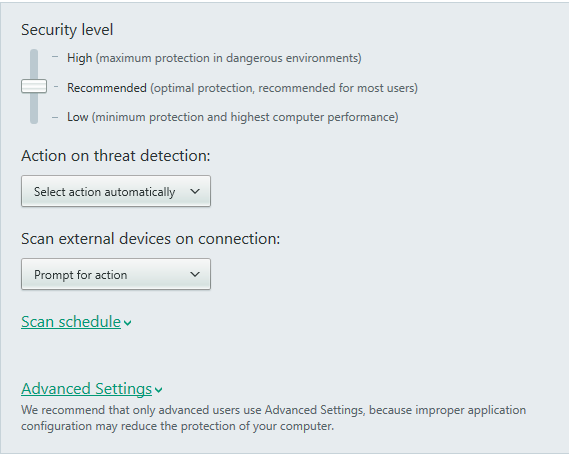 Kaspersky antivirus guard offers a number of options as seen in the above screenshot to enhance the performance of itself and its operations. Some of the options are very obvious, but for the sake of the completeness, all the options are explained here. “Disable scheduled tasks while running on battery power” : This option is quite useful for laptop and notebook users, as they are usually powered by the internal battery, and thus consuming the power is very important. 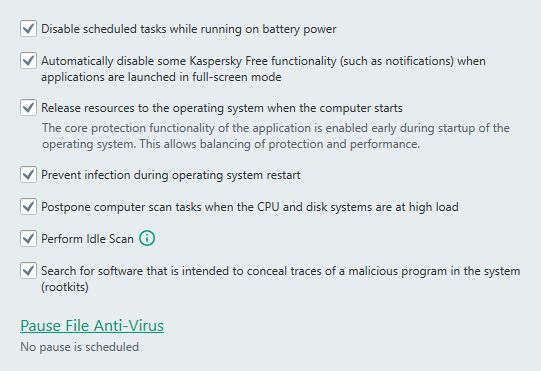 Kaspersky detects whether the computer is on battery powered mode or AC mode. If it’s on battery powered mode, the antivirus guard automatically disables the scheduled tasks in order to preserve the power of the machine. 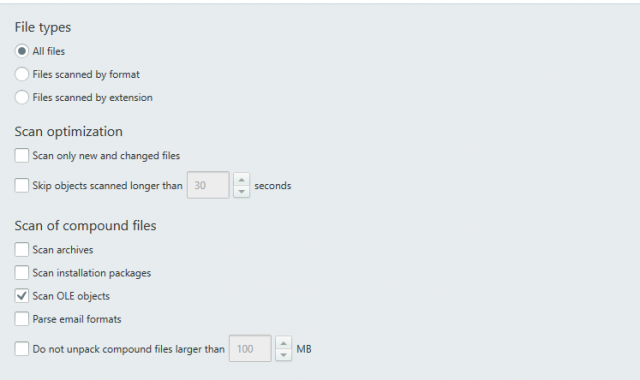 “Automatically disable some kaspersky free functionality when applications are launched in fullscreen mode” : This option is mostly targeted for users who play video games, and watch movies in fullscreen mode. When either the game or the movie is in full screen mode, it can be annoying to see random notifications appearing in the screen. To prevent such moments, turn on this option. “Release resources to the operating system when the computer starts” : This option makes Kaspersky to postpone its operation. There are no known disadvantages of this method in the “Antivirus Guard”. However, if it’s “Internet Security” version, and computer is connected to the Internet, then this option is not recommended as it puts the computer at the risk since the antivirus guard is launched a bit later after the operating system is started up. The advantage of this option is, it speeds up the startup of the computer in slow computers by conceding the system resources to the Windows operating system. “Prevent infection during operating system restart” : When the computer is about to be restarted, certain malicious files can randomly appear in the local file system. 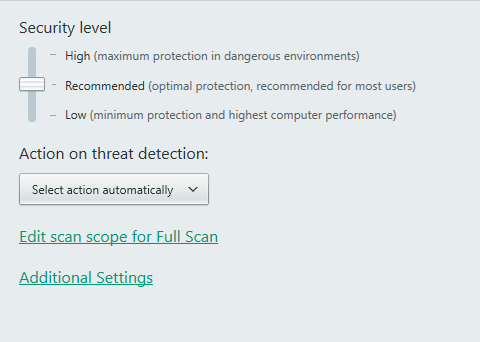 If this option is selected, Kaspersky scans such files that appear when the computer is being restarted, if it found any files are infected, they are treated depending on the action used in the Settings. “Postpone computer scan tasks when the CPU and disk systems are at high load” : What this basically says, if both the CPU (central processing unit), and the hard disk are quite (like 80%+) busy doing something like when playing a videogame, Kaspersky postpones its operation until both these devices are not busy, and therefore this option is ideal for video gamers on Windows. 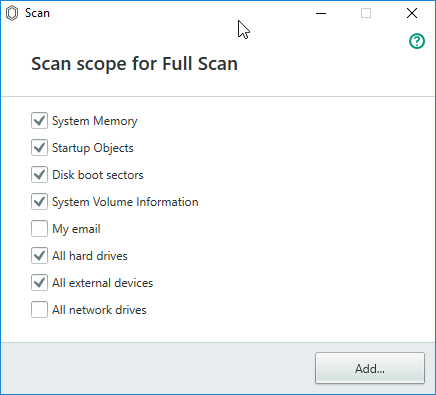 “Perform Idle Scan” : This option further enhances the above option’s functionality by making Kaspersky to scan and update its database ONLY when the computer is idle. “Search for software that is intended to conceal traces of malicious program in the system” : There are certain applications known as Rootkits that conceal its traces, operations without being detected. With this option enabled, Kaspersky can detect such programs, and neutralize them. File-Antivirus feature usually scans files and executables when they are launching and running, and thereby increasing the workload to the system. 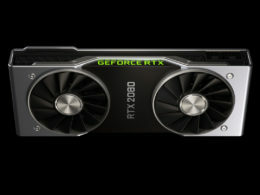 This may not be good for lower-end computers when it gets busy with certain scheduled tasks or when certain applications such as video gamers, graphics applications such as Photoshop or 3D modeling or rendering software are used. 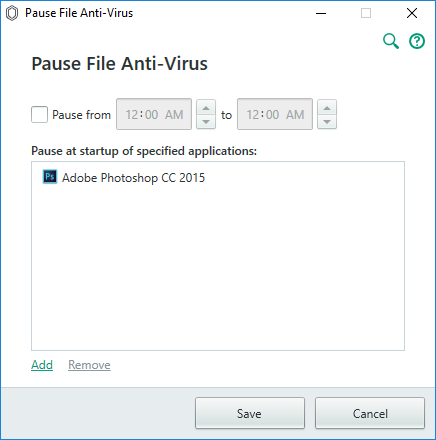 To prevent File-Antivirus to scan files during certain time periods (like during busy office hours) or when certain applications are being utilized use this “Pause File Anti Virus” feature. “Pause from” option specifies when File-Antivirus to be pauced, “to” in the same row specifies when it has to be enabled back. “Pause at startup of specified applications” option species whether the File-Antivirus to be paused at startup of the added applications in the list. 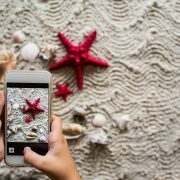 For instance, if you regularly play video games, add all the executables of those video games here, then File-Antivirus pauses itself at startup of the aforesaid videogames, and thereby conceding the system resources to the video game. 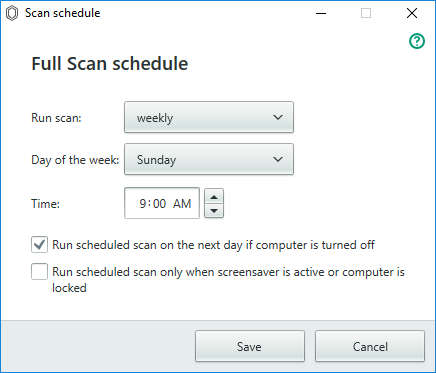 In the “Scan” tab in Settings, the behaviour of the scanning is defined such as what to do when a threat is detected, how aggressive the scanning is supposed to be, whether to scan external drivers or not, when to schedule the scanning and other “Advanced Settings”. In Advanced Settings the behaviours are somewhat same but categorized into “Full Scan”, “Quick Scan”, and “Selective Scan” modes. In each mode there are a set of the behaviours like in the above screenshot, and they are only used when the respective scan mode is used to scan a file. For instance if “Full Scan” is used to scan the system, its behaviours specified in “Full Scan” mode are used when scan is being done. Additionally there are two more options under the each mode, “Scan Scope”, “Additional Settings”. Both these options are explained right after the Scan Schedule section. 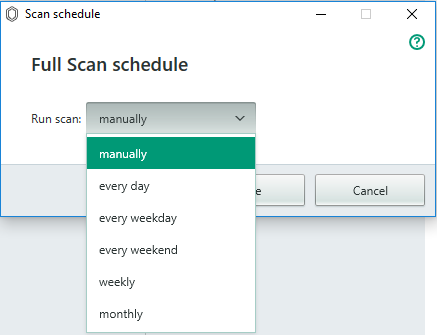 Clicking on the “Scan schedule” prompts two options. “Full Scan”, “Quick Scan”. 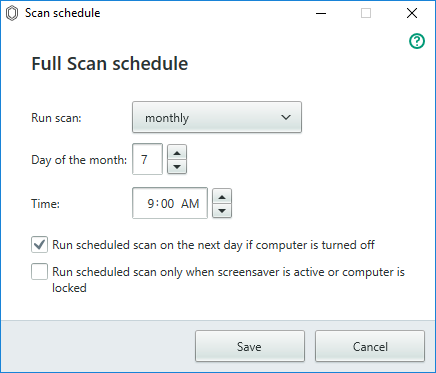 When either of the options are selected the following window appears where the scan can be scheduled at a particular time on a particular day. Selecting manually does nothing special as it expects us to do the scan. 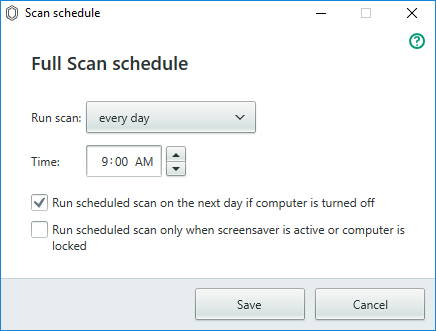 However, selecting any other option prompts the antivirus guard to scan the computer at the scheduled time. Like each mode has their own separate set of behaviors as stated earlier, each mode also has a scope to cover when scanning. So when the particular scan mode is used, Kaspersky only scans the stated areas. This is quite useful to conserve the time, and resources. As stated earlier, each mode has its own “Additional Settings” which are only used when the respective scan mode is used. The options in the above 2 screenshots are self explanatory, and thus they ain’t explained further. However it’s important to keep in mind that, these settings are only for Advanced users, and should only be used with knowing the consequences of changing them. 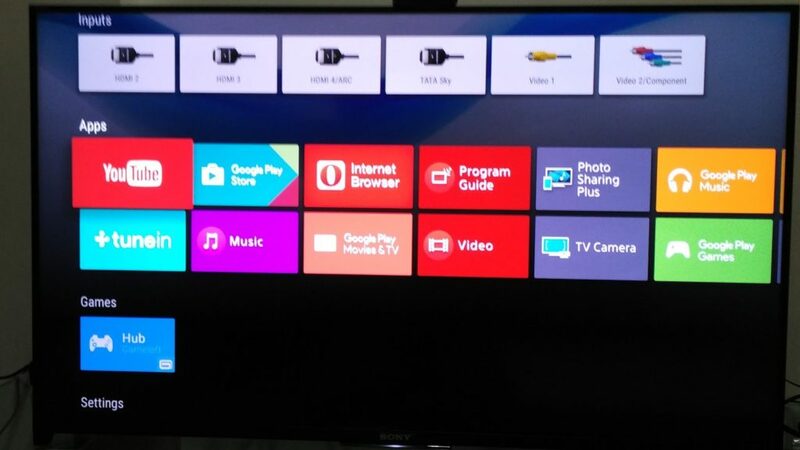 There is no reset to default button, so be careful when changing any of the options in the “Advanced Settings”. If it’s possible take some screenshots of the options before changing them, so they can be reset back in the case of inappropriate change. Update : This section specifies whether to download and install new version of the application or not, and when and how to update the database for the Antivirus guard. Database can be updated either from the Kaspersky servers or by downloading the update files and pointing its location in the local file system. Like the scan can be scheduled, updating database can also be scheduled. Threats and Exclusions : Trusted applications can be added to the exclusion list for being excluded from scanning. Advanced disinfection technology specified here consumes a considerable amount of system resources, and therefore should not be used in low end computers. Apart from the traditional protection offered by other antivirus guards, Kaspersky offers protection against software that criminals use to damage the computers and your personal data, the option belongs it found here. Self Defense : Self defense mode makes sure Kaspersky protects its integrity. So the malware can’t damage its files, processes. Network : This section instructs Kaspersky extension installed in the web browser how to behave, and what to do when certain conditions are met. Here options are “Limit traffic on metered connection” for conserving the bandwidth. “Inject scripts into web traffic to interact with web pages” to scan the web page to identify malicious scripts and web pages. “Monitored ports” to monitor computer’s ports when using Internet, by default only commonly used ports are monitored, but more can be added as one prefers. “Encrypted connection scanning” specifies whether to scan encrypted connection (the sites with green padlocks) or not. If this option is enabled, the certs of all the encrypted websites are replaced with a cert of Kaspersky antivirus guard. Finally the proxy settings are specified here, if the computer is connected to the Internet over a proxy server make sure to state the proxy server/its port and password and username if used. Reports and Quarantine : The size, and time period for retaining of event reports and Quarantined files are stated here. 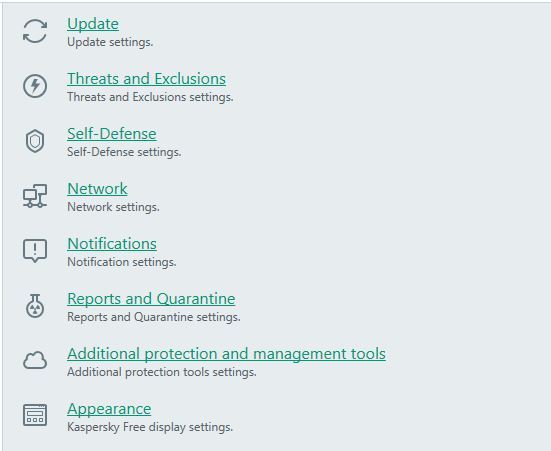 Additional protection and management tools : Upon enabling this section’s option, the Kaspersky antivirus leverages its cloud network to identify and disinfect malware files, and websites. Appearance : If the computer has less resources to render GUI elements in the screen, turn off the options in this section. 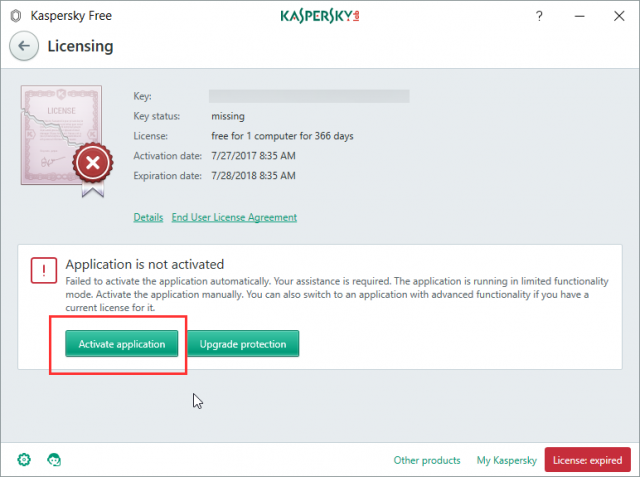 When the kaspersky free antivirus guard is expired, head to the “Licensing” section by clicking on the “License expired” button painted with red color, then click the “Activate Application” button to renew the license key for free of charge, this way the Kaspersky antivirus guard can be used for lifetime. Currently the renewal charges are free, but it’s not sure how long it will be like this. When the license is expired, Kaspersky automatically limits its functionalities, but once it’s renewed functionalities are enabled back to the user. 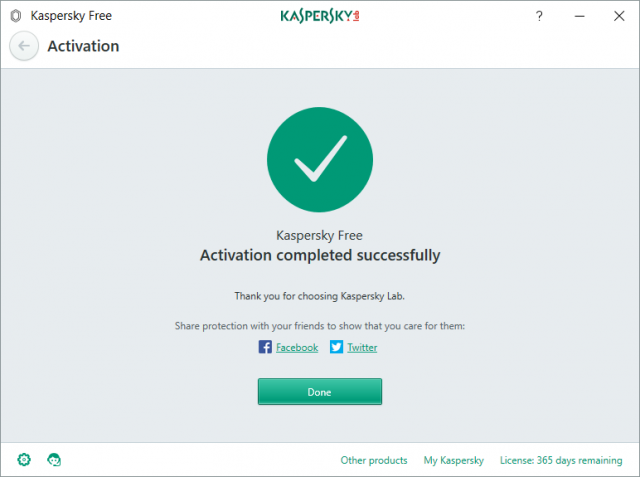 Kaspersky free antivirus guard can be download for free of charge at this location (Kaspersky Free Antivirus for pc full version). The file is roughly about 2.27MB, but while it’s installing, it downloads over 150MB of contents. Also when it updates its database, it may further consume more data. If you are on a metered connection, make sure to enable “Limit traffic on metered connections” in Settings -> Additional -> Network Settings to lessen the bandwidth consumption.